Illustration showing a vessel before (A) and after (B) it is coiled. The deployed coils prevent blood flow in the aneurysm. A coiling procedure is performed as an extension of the angiogram. A catheter is inserted into a vessel over the hip and other catheters are navigated through the blood vessels to the vessels of the brain and into the aneurysm. Coils are then packed into the aneurysm up to the point where it arises from the blood vessel, preventing blood flow from entering the aneurysm. Additional devices, such as a stent or a balloon, may be needed to help keep the coils in place inside the aneurysm. Stent assisted coiling involves permanently placing a stent in the vessel adjacent to the aneurysm to provide a scaffolding of support that keeps the coils within the aneurysm sac. Balloon remodeling involves temporarily placing a removable balloon adjacent to the aneurysm while coils are positioned in the aneurysm. Once the patient has been anesthetized, the doctor inserts a hollow plastic tube (a catheter) into an artery (usually in the groin) and threads it, using angiography, through the body to the site of the aneurysm. 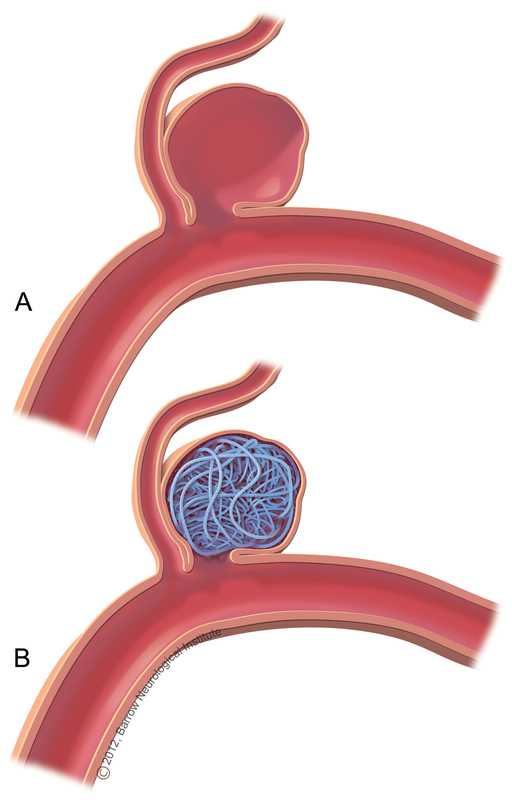 Animation showing the endovascular placement of aneurysm coils. A sheath is introduced into the femoral artery, and a guidewire and catheter are navigated to the aneurysm site via the aorta and internal carotid artery. Using a guide wire, detachable coils (spirals of platinum wire) or small latex balloons are passed through the catheter and released into the aneurysm. The coils or balloons fill the aneurysm, block it from circulation, and cause the blood to clot, which effectively destroys the aneurysm. The procedure may need to be performed more than once during the patient’s lifetime. There have been considerable advances in endovascular techniques over the last few years and the field continues to evolve. Most notable is the use of new flow diverting embolization devices. These devices are similar to a stent in that they are placed into the main vessel adjacent to an aneurysm. These devices divert flow away from the aneurysm and provide a scaffolding for healing of the vessel wall to occur. Over time, the aneurysm disappears. This technology allows your doctor to treat many aneurysms that were previously considered untreatable or that were considered to be high risk by other methods. There are many other new devices that are becoming available as well, such as newer that are easier and safer to deliver, as well as stents that can bridge two vessels. Patients who receive treatment for aneurysm must remain in bed until the bleeding stops. Underlying conditions, such as high blood pressure, should be treated. Other treatment for cerebral aneurysm is symptomatic and may include anticonvulsants to prevent seizures and analgesics to treat headache. Vasospasm can be treated with calcium channel-blocking drugs and sedatives may be ordered if the patient is restless. A shunt may be surgically inserted into a ventricle several months following rupture if the buildup of cerebrospinal fluid is causing harmful pressure on surrounding tissue. Patients who have suffered a subarachnoid hemorrhage often need rehabilitative, speech, and occupational therapy to regain lost function and learn to cope with any permanent disability. Sometimes an occlusion is combined with a bypass. A bypass reroutes blood flow around the occluded artery. Doctors take a small blood vessel from another part of your body, usually the leg, and graft it to a section of the brain artery where it makes most sense. This new artery (bypass) brings blood to the part of the brain that had been fed by the damaged artery. Comparing the long-term results of coiling vs. clipping of aneurysms is an area of ongoing study. Clipping has proven its long-term effectiveness over several decades. In recent years, coiling has gained acceptance as an alternative to clipping for treatment of ruptured subarachnoid hemorrhage (SAH). There have been considerable advances in open surgery techniques. Many neurosurgeons can now perform mini craniotomies, or eye brow incisions to clip an aneurysm. In select patients a small incision is made over the eyebrow. A small two inch window is then made in the bone over the eye and through this incision a small clip is placed across the opening of the aneurysm. These patients usually spend 1-2 days in the hospital after surgery and then go home. Patients are usually on light restricted activity for 1-2 months after surgery. However, it is still an invasive procedure and takes longer to recover from than a coiling procedure. Both open surgery and endovascular methods are effective. The best treatment for you depends on a number of factors: whether your aneurysm has ruptured, it’s size, shape and location. Like all medical decisions, the best treatment option should be made with your physician.